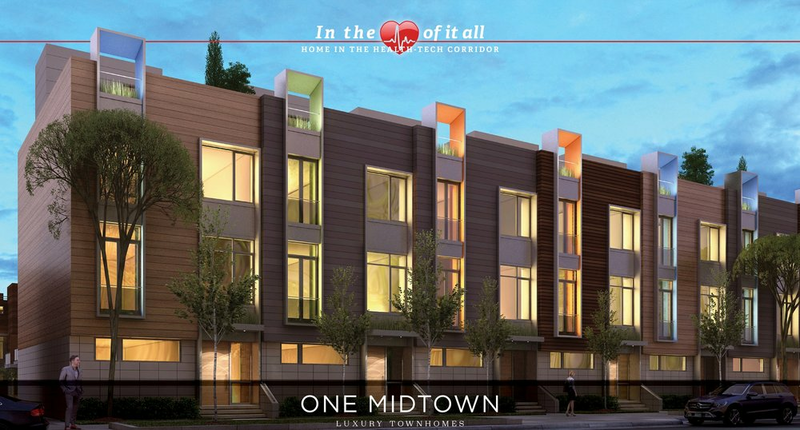 Thank you for reaching out to the One Midtown Luxury Townhomes team. One of our associates will be in touch with you soon. To receive additional information or reserve a townhome today please provide the following details. One of our customer-service representatives will be in touch with you soon. We respect your privacy–information shared with the One Midtown team is considered confidential and will not be utilized by third-party services. For more information—Keller Williams Greater Cleveland, Zachary Nicolay, 216-973-6484. One Midtown Luxury Townhomes—Introducing an exciting new transit-oriented community of modern contemporary townhomes coming to the heart of Cleveland's vibrant Health-Tech Corridor (HTC) in MidTown Cleveland. These brand townhome residences combine both state-of-the-art amenities & luxury living within a convenient location footsteps away from the Cleveland Clinic and minutes from University Hospitals and University Circle. For more information on University Circle or Downtown Cleveland contact Zachary Nicolay, Keller Williams Greater Cleveland, at 216-973-6484. *The information contained herein has been obtained from sources believed reliable but cannot be guaranteed as to its accuracy. “BD EUCLID AVE LLC,” and/or “One Midtown” or “One Midtown Luxury Townhomes,” collectively, herein referred to as “One Midtown” makes no guarantees, warranties, or representations as to the completeness or accuracy thereof. The presentation of this property is submitted subject to errors, omissions, change of price or conditions prior to sale or lease, or withdrawal without notice. It is the policy of One Midtown to provide continual attention to design and construction requires that all specifications, features, materials, pricing and dimensions are subject to change without notice. © 2017 BD EUCLID AVE LLC, All rights reserved. For more information contact Zachary Nicolay, Keller Williams Greater Cleveland, 216-973-6484.